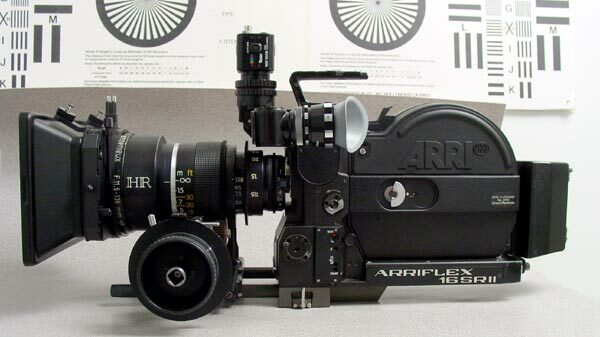 Arriflex Super 16 SRII-E, shown here with OPTIONAL EXTRAS: Angenieux 11.5-138mm T2.3 HR Super 16 Zoom Lens, with CinemaTechnic Integrated Lens Support and Zoom Gear Ring, CinemaTechnic 15mm Lens Support Bridge, CinemaTechnic Superlite Baseplate with 15mm Carbon Fiber Rods, ARRI Studio Follow Focus II, ARRI LMB-5 Lightweight Matte Box with 114mm Clamp Adapter and 4 x 5.65″ Filter Trays. These items are available for extra cost. THIS CAMERA HAS BEEN SOLD. THANK YOU FOR YOUR INTEREST. NOTE: I’ve left this page up as a reference. This was my personal 16SRII that I owned and operated for 10 years. 16SR II-E No light meter, like the SR3 Advanced, which makes the viewfinder 25% brighter. The viewfinder is as bright with the Jurgen’s video assist, as a standard SRII is without video assist. PL Mount, Super-16/ regular-16 Switchable. P+S Technik Super-16 Conversion, maintains 180º shutter angle with SR3 pull down link. You can’t shoot monitors with the other conversions that have 172.8º shutters. Adjustable Pitch Control (like SR3) for sound level reduction. Includes choice of one Super 16 Fiber Optic Viewing Screen (ground glass, fiberscreen) in your choice of format markings, and one SR3 TV/1.33 standard 16 fiberscreen. See this page for choice of available format markings. Upgraded with latest 1.26mm Registration Pin from SR3 for perfectly steady registration up to 75fps, movement capable of 200fps with optional P+S Technik High Speed Conversion. Two 400ft Mags, converted to full Super-16 compatibility by P+S, including repainting and new SR3 style rubber handles. Two On-Board Batteries, upgraded with Victory Battery’s 1.80 Amp-Hour high capacity cells. CinemaTechnic One hour Digital Peak Detecting Charger is included (charges both batteries in less than one hour). Jurgen’s Video Assist with Color CCD video camera. This is one of the the best video assist conversions on the market. It is fully Super 16 compatible, unlike the Lee Utterbach conversion*. The Jurgen’s has a perfect picture that never goes out of focus or alignment. This is the preferred SR video at rental houses in the U.S. This video assist tap alone sells for $3,100.00, without the CCD camera. The only better system we have seen is the P+S Technick SR3 style video assist, which is $2,461.00, and also requires either the $4500.00 SR 3 Optical Elbow, or the $1800 CEI Optics and the $10,500 CEI Color VI. Dual 11-pin Fischer Sockets. Can power a speed control and zoom control at the same time. Built-in 24, 25 and 30 fps Crystal. Digital Voltage Peak Detecting Charger. Can charge both on-board batteries in 1 hour. ARRI EFC (Electronic Footage Counter) digital tachometer and footage counter, or ARRI-Tach with same functions, plus analog variable speed control (choice of one). Custom fitted Pelican 1650 case, with heavy duty custom cut foam. Camera is in mint condition. The cosmetic and mechanical condition is excellent.This is a two two owner camera. First owner was WDR Television in Germany. Second owner is Diaz-Amador Productions, since 1994. Used as DP’s personal camera and never rented.This camera has had two full overhauls during our ownership, 6/1995 by Camwerke, and 10/2000 by P+S Technik (during the Super-16 conversion). This camera has been extremely reliable in service. Complete maintenance records will be provided to the purchaser. These items will only be offered to the purchaser of the camera at these prices and are not available separately. Optar Illumina 8mm T1.3 Super-16 Prime Lens, PL mount. Full Super 16 coverage. Only T1.3 stop available in an 8mm focal length lens. Same optical quality as $8,500.00 Optex 8mm T2.0. New condition. $2,795.00 Price only with purchase of 16SRII-E. Regular CinemaTechnic price is $3,495.00. Payment will only be accepted by Cashier’s Check or Bank Wire Transfer. We do not offer financing of any type, nor can we accept credit cards or PayPal payments on this item. We can arrange inspection in Miami, FL, at ARRI in Blauvelt, New York, and at ARRI in Burbank, CA or Camwerke in Upland, CA. A 180 day limited service warranty will be provided to the purchaser. Please contact us for details.